The progesterone cream, AllVia Progensa Plus has been recommended by more holistic doctors than any other. Formulated with the finest natural bioidentical progesterone with phytoestrogens/plant based estrogen and with no parabens. Certified to USP/United States Pharmacopeia standards. Containing 1500 milligrams per ounce, 4 ounces per container and 90 doses per container. Bioidentical Progesterone with plant phytoestrogens will reduce the intense symptoms and discomfort of menopause, perimenopause and other hormonal imbalances without the side effects associated with synthetic chemically derived hormone replacement therapy. Bioidentical hormone replacement is safe, so safe that you can obtain it without a doctors prescription. Why? because there have been no adverse side effects from bioidentical progesterone cream. Unlike synthetic hormones, natural bioidentical hormones are what the body truly needs and craves for a womans body to operate effectively as it did before and will again if supplied the proper bioidentical hormone not a synthetic version. Progesterone and all hormones are absorbed more effectively through the skin than artificial or synthetic oral hormones. Initially, in progesterone deficient women much of the progesterone is absorbed by the body tissues, In time with repeated doses sometimes initially twice a day, levels return to normal and most women notice results within days, while for others it may take longer. For many women, bioidentical progesterone cream provides significant relief from symptoms related to shifts in the female hormones estrogen and progesterone. It has been found that trans dermal or skin application allows it to be absorbed easily and faster without the worry of poor absorption or deactivation from the liver enzymes. Only a small percentage of any medication or supplement is really absorbed by the colon. The most effective means for any woman is by applying the the hormone topically to the skin. Many women going through perimenopause or menopause use bioidentical progesterone as a gentle effective alternative to the synthetic progesterone found in conventional hormone replacement therapy (HRT) drugs that is synthesized from pregnant horse mare urine. For younger women, such imbalances are often associated with symptoms such as uterine fibroids menstrual cramps, irritability, breast tenderness, pelvic pain, endometriosis and bloating with weight gain. For older women entering menopause, decreasing supplies of progesterone can cause hormonal imbalances, producing hot flashes, night sweats, mood swings, urinary incontinence, hair loss, depression and poor or reduced health. Studies indicate that progesterone creams help curb hot flashes and hormonal imbalances associated with PMS and Menopause. Other hormonal conditions such as PCOS, uterine fibroids and PMDD. Clinical trails at St. Luke's Hospital in Bethlehem, Pennsylvania, demonstrated that natural bioidentical progesterone reduced or eliminated hot flashes in 83 percent of the healthy postmenopausal women tested. Other medical studies have shown uterine fibroids to be significantly reduced in size and number when balancing the excess estrogen which is a primary cause of fibroid growth. Hot flashes, night sweats, weight gain, urinary incontinence, vaginal dryness, libido, have also shown to be significantly improved by the use of bioidentical progesterone cream. Important Information: You should try to avoid xenohormones. If you do NOT avoid xenohormones progesterone will not be as effective. Long term chronic xenohormone exposure causes estrogen receptor overstimulation and is a known carcinogen and fibroid tumor stimulator. Women who are having hormonal imbalances shown by exhibiting endometriosis, PCOS, fibroids or PMDD. All women who use topical bioidentical progesterone cream should still take supplemental calcium (1000-1500 mg a day) to help prevent osteoporosis. Progesterone cream is easily and quickly absorbed into the body so you can apply it almost anywhere with success. We recommended that you rotate the areas you apply it, to avoid saturating any one area. It is best absorbed where the skin is relatively thin and well supplied with capillary blood flow, such as the face, neck, upper chest, breasts, inner arms and inner thighs and wrists. Apply and massage into your skin until it is noticeably absorbed. Natural progesterone cream should not be applied over top of other body creams or perfumes as they may interfere with ideal absorption. Apply once a day at bedtime for 25 consecutive days followed by a five-day break or as recommended by your physician. Apply once or twice daily as needed, starting on the 7th day after the first day of menstrual flow thru the 27th day. Apply once a day at bedtime on days 12 through 27 of your cycle or recommended by your physician. Premenstrual Irritability: We recommend you try Natural Progesterone without the phytoestrogens first and if this does not give you satisfactory relief then try natural progesterone plus with phytoestrogens. Progesterone is not recommended when pregnant or breastfeeding unless your health care provider specifically recommends it. AllVia Progensa Plus bioidentical progesterone cream is formulated to clinical strength and made from all natural ingredients. It is non-oily, does not leave a residue on the skin, and it has extremely effective absorption qualities. Under normal usage, the 3 oz. container will last more than two months or 68 applications. Although initially women may use it twice a day to speed their symptom relief and then the container lasts a little longer than a month. Usually one month of a double dose application is enough to catch a woman up to her deficits and then she will find that once a day is giving her all the relief she needs. 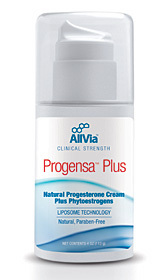 AllVia Progensa Plus Bioidentical Progesterone cream contains all natural ingredients, including, grape seed extract (a natural preservative), aloe vera, vitamin E, primrose oil, burdock, & dong quai all of these enhance the performance of natural bioidentical progesterone cream when it is applied to the skin. The bioidentical progesterone cream is sealed in an airtight clinical hygienic pump to protect the cream from losing its potency. This unique airtight pump container protects the progesterone from oxidation, microbial contaminants and ensures the same potency of each dispensing dose. Natural bioidentical progesterone, (certified to contain 400 mg of USP all natural bioidentical progesterone per ounce and 20 mg per dispensing dose/1 pump). This 3 oz. containers holds 68 doses of progesterone cream which should last you more than two months. The accepted standard dose of bioidentical progesterone cream is 20mg per day which is exactly what you get per dispensing pump.